The “Fiddlin’ Around” group, Craig Dudgeon (left with mandolin), Peter Airey (center with fiddle), and Craig Thompson (right with guitar), provided an entertaining morning with folk and Irish music to the delight of their PCEC audience. The PCEC meeting on June 10 had two presenters, one entertaining and the other informative. First up was a group of musicians who have named themselves the “Fiddlin’ Around” group. They explained that they love playing bluegrass, fiddle music, and traditional Irish tunes. They were followed by Patamaporn Klinkesorn who spoke about the benefits of the traditional medicinal plants Moringa and Chia. 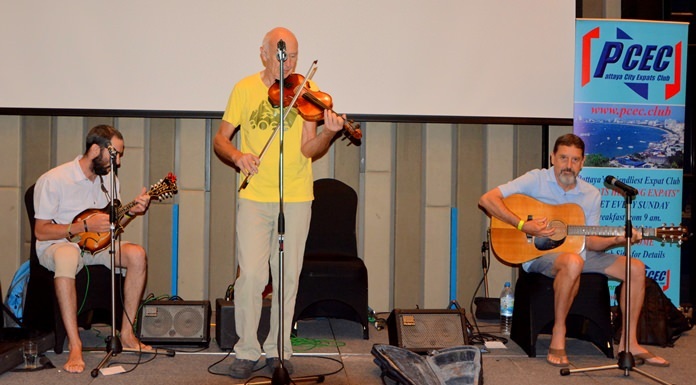 The Fiddlin’ Around group consisted of Craig Dudgeon (normally plays mandolin), Craig Thompson (normally plays guitar & mandolin) and Pete Airey (normally plays fiddle, guitar, guitar-ukulele hybrid, and performs vocals). Thai herbalist Patamaporn Klinkesorn presents the nutritional and health benefits of the traditional medicinal plants Moringa and Chia. After the initial formalities were out of the way – the guys got off to a quick start by playing & singing the following songs: 1) Angeline the Baker (fiddle tune); 2) Red Haired Boy (fiddle tune); 3) Lost Highway (song); 4) Jesse James (song); 5) St. Anne’s Reel (fiddle tune); 6) Arkansas Traveler (fiddle tune); 7) Cherokee Shuffle (fiddle tune); and 8) Tear in my Beer (song). The group gets together weekly with a number of other musicians – with no set schedule and with no set list of band members. 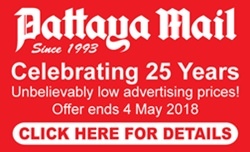 Some of the guys are still working, some are retired, but all are enjoying living in Thailand. They come from very different backgrounds, some come from America and some from England or Ireland. Their love for the same type of music has been a great way for them to get to meet and become friends over the last couple of years. The next item on the agenda was a short presentation from Thai herbalist Patamaporn Klinkesorn, on the traditional medicinal plants Moringa and Chia. 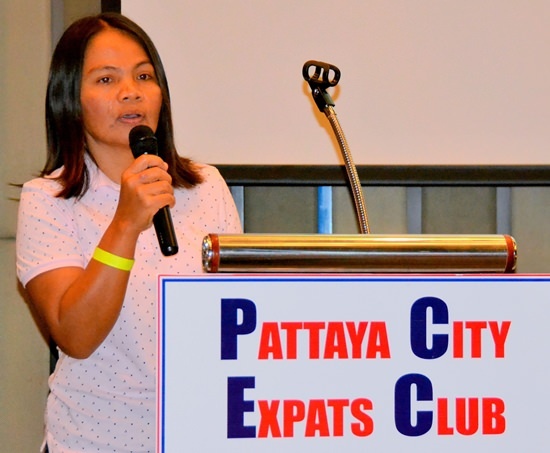 Patamaporn has a 12 year background in teaching chemistry & biology to high school students. She explained that the seeds of Moringa and Chia plants are widely available in Thailand and offer many health benefits. A slide presentation highlighted the benefits to be gained from these foods. These plants are cultivated throughout the tropics and marketed as superfoods, health foods, and medicinal plants. Moringa seeds, from the Moringa plant, are annually harvested in Asia and Africa. They are highly valued for their nutritional benefit, just like the Moringa plant itself. Moringa benefits include providing antioxidants and anti-inflammatory compounds, balancing hormones and slowing the effects of aging, improving digestive health, balancing blood sugar levels and helping fight diabetes, protecting and nourishing the skin, helping to stabilize mood, and protecting brain health. Chia seeds are among the healthiest foods on the planet. They are loaded with nutrients that can have important benefits for body and brain. They are high in vitamins, anti-oxidants, magnesium, iron, potassium, phosphorus and fiber. Member Ren Lexander presents Patmaporn klinkesorn with the PCEC’s Certificate of Appreciation for her informative talk. 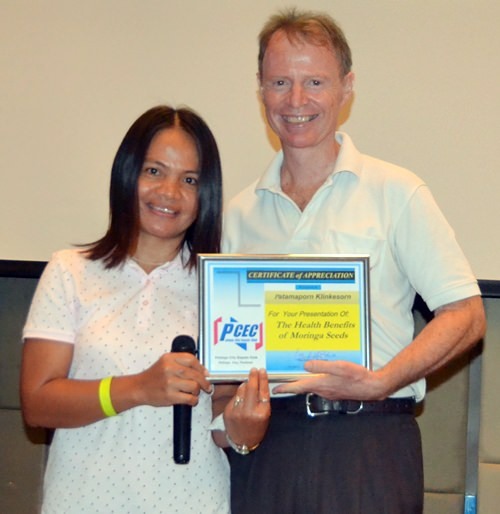 After the presentation, MC Roy Albiston brought everyone up to date on upcoming events which was followed by the Open Forum where members and guests can ask questions or make comments about Expat living in Thailand. For more on the PCEC and their activities or to subscribe to their weekly newsletter, visit www.pcec.club.